Revive a tired wood vanity with this step-by-step painting tutorial. 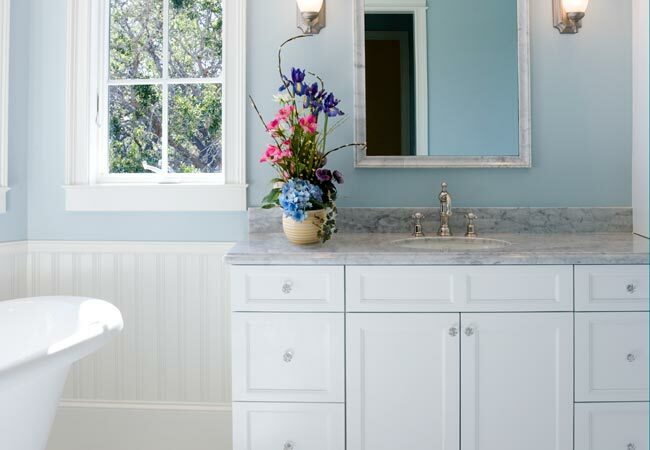 If your bathroom vanity has gone dingy with heavy use and exposure to moisture—or it’s just looking dated—paint can come to the rescue by offering an easy way to refresh your storage piece. 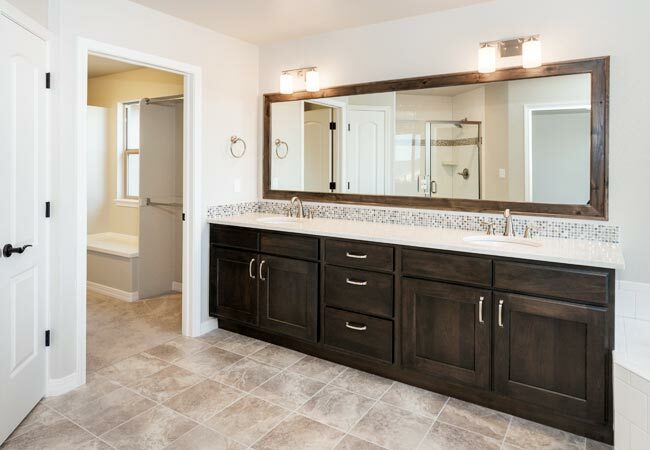 Yes, you can successfully paint both solid wood or engineered wood, no matter whether the bathroom cabinets are unfinished, sealed, or previously painted. Careful surface preparation, meticulous technique, and the right products are key to professional-quality results. Get started with our thorough guide on how to paint bathroom cabinets, and you’ll find all the tools you need to give that vanity a beautiful, durable new look. Lay drop cloths on the floor around the bathroom cabinets to protect it from sanding dust and paint. Remove all items from the cabinets and temporarily store them elsewhere. • If the hinges of the cabinet doors are mounted with clips, unclip the side of each door hinge mounted to the interior, then lift each door from the cabinet. • If the hinges are mounted with screws, loosen with a screwdriver the screws that secure each cabinet door hinge to the cabinet. (There’s usually one set of screws securing the hinge to the door and another set securing the opposite side of the hinge to the cabinet interior.) Store screws in a safe place and then pull each door away from the bathroom cabinets, along with its hinges. Set the doors and hinges aside where they won’t get splashed with paint. Remove the cabinet drawers, starting with the top-most one. Pull out the drawer as far as possible (it will naturally stop rolling forward when the wheels reach the end of the drawer rail). Tilt the drawer downward and toward you to lift its wheels off the rail, then pull the drawer straight out to remove it. Set drawers safely aside. Remove door and drawer hardware with a screwdriver. (The screws that secure each pull or knob are usually located on the back of the door or drawer face.) Lift hardware from the front of the door or drawer and set it all aside safely away from the paint. Use painter’s tape to cover any bathroom cabinet surfaces you don’t want to paint, such as the underside of the vanity top, and any exposed wall areas adjacent to the cabinet. Tape old newspaper to the inside of the bathroom cabinets unless you plan to paint the interior as well. After donning gloves and a respirator, dilute one-quarter cup of trisodium phosphate (TSP) in one gallon of warm water in a bucket. Then vigorously scrub down the outer and inner cabinet frame, the door and drawer fronts, and, if desired, the door backs, with a sponge saturated in the TSP solution. Make a second pass over the cleaned surfaces with a water-dampened sponge to remove the TSP solution. Towel-dry well, and then air-dry completely. • If sanding an unfinished cabinet, make single pass over the cabinet surfaces with 220-grit sandpaper. • If sanding a cabinet topped with paint or a clear protective sealer, make a first pass with a medium-grit (120- to 150-grit) sandpaper over the cabinet surfaces to remove the clear coat or any peeling paint. (You’ll know if your cabinet has a clear protective sealant if the coating flakes off when you lightly scrape an inconspicuous area with a knife.) Then, finish with a light sanding using 220-grit sandpaper. Vacuum sanding dust from the cabinet using a dust brush attachment. Wipe down the sanded areas with a water-dampened cloth, then make a final pass over the cabinet with a tack cloth. To prime the cabinet, pour a small amount of shellac or oil-based primer into a paint tray. Both shellac and oil-based primers are generally more effective than latex primer in defending bathroom cabinets against moisture, but shellac primers minimize brush marks more effectively than oil-based primers. Plus, it affords more flexibility: You can use either an oil-based or water-based paint over it! Load the roller cover with primer, then work it over the outer and/or inner cabinet frame in the direction of the wood grain. Next, tackle flat areas of the door and drawer fronts. For grooves in door and drawer fronts, apply primer with a natural bristle brush to better reach recesses and tight corners. Let the first coat of primer cure according to the manufacturer’s instructions. Repeat Steps 9 and 10 to prime the cabinet door backs, if painting them. To paint the cabinet, pour a small amount of oil- or a latex-based paint from a can into a paint tray. (The best paint for wood located in moisture-intense environments bathrooms and kitchens is oil-based, but mold- and mildew-proof latex-based interior paints—available from Zinsser and other brands—can be swapped in for oil paint if you prefer a faster-drying paint that emits fewer volatile organic compounds.) When choosing paint, note that semi-gloss and high-gloss repel moisture more effectively than flat and eggshell, and darker shades hide dirt better than lighter colors. • If rolling on oil-based paint, opt for a natural fiber, polyester blend, or wool roller cover. • If applying latex paint, use a synthetic roller cover. Load the roller cover with paint, then apply a base coat to the outer and/or inner cabinet frame. 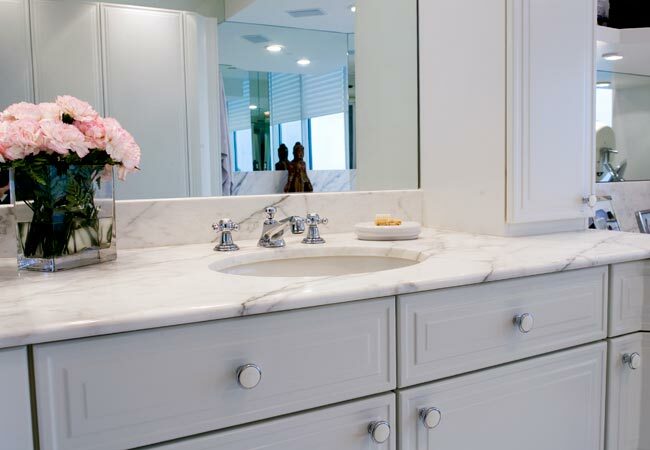 Next, paint your bathroom cabinets’ flat areas (the door and drawer fronts) in the direction of the wood grain. • If working with oil-based paint, use a natural bristle brush to paint grooves in the door and drawer fronts. • If it’s latex-based paint, use a synthetic bristle brush. Let the base coat dry according to the manufacturer’s instructions. Give your bathroom cabinets one to two additional coats of paint over the base as needed to achieve the desired depth of color. Allow each coat to dry fully before applying the next, then let the top coat dry fully. Repeat Steps 12 and 13 to paint the cabinet door backs, if desired. Discard the drop cloths and remove the painter’s tape from the cabinet. Retrieve the hinge screws (or clips) to re-attach the door hinges to the cabinet. Reinstall the cabinet doors and drawers as you removed them, then re-attach the door and drawer hardware.